Bride: Should I go for an updo, a chignon or waterfall braids? Oh wait! I just chopped off my hair for summer and I don’t think it’s going to grow that long for my winter wedding!” Damn, what do I do?! Bride (annoyed and irritable): But mom, he likes the crew cut. And I like the crew cut. Can’t we reverse the solution and I just wear an outfit that suits my current hairdo? Mom of bride (exasperated - Hands to head) Beta, do you want to arrive at your wedding mandap in torn denims or camouflage harems? Conversation sound familiar? Are you getting nightmares of wearing that perfect lehenga and having the most disastrous hair day on your wedding day? Alternatively your stylish short do is such a huge part of your personality that growing those tresses might mean you are occupying someone else’s body? Stress not, as this week we’ve collated glam wedding hairstyle for the short hair brides. You don’t have to worry about having a bad hair day or losing your personality anymore. We also share tips on how to accessorize your mane the right way. While our lookbook may be a steal for catholic brides, all others can rock these stunning hairstyles for their pre-wedding festivities and wedding reception. From chic braids, curly updos to fishtail braids and more, grab all the ideas and inspiration you need and do it yourself, or ask your stylist to steal the look. 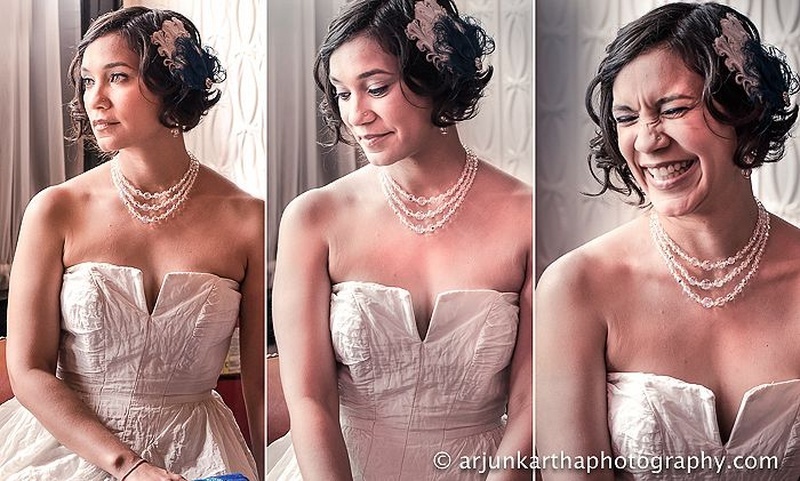 See how our real bride Adrienne totally nails the short hair bridal look. Thinking to go short?! Try these looks! Dare to go too short? A bride generally focuses so much on how to style her hair that she completely forgets the most crucial part that will accentuate her overall bridal look. Accessorize your gorgeous braids, updo or a chignon with statement pieces that grab all the attention your need on your big day without completely stealing the show. Selecting the right hair accessories can be a tricky business. The simple hack here is to choose one that will complement the overall aesthetics and not overpower it. Here are a few suggestions to do it right. Afraid that real flowers will fade by the time you near the end of your celebration? Remember the word – Choose an accessory that compliments and doesn’t overpower! Note: Your hair colour can make or break the look. Ensure you do not neglect that element. Also, avoid going overboard with it. Check out more wedding hairstyle inspirations here.